No one knows why Captain Florencio Marimon and owners of the 633-foot Sulpicio Line passenger ferry Princess of the Stars decided to steam out into the teeth of an oncoming typhoon that capsized the ship and claimed over 800 lives that fateful day. 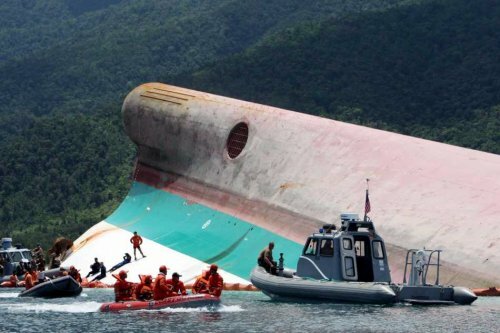 Whatever the reason, the 24-year-old vessel, laden with over 700 passengers, 121 crew members and a strange cargo of highly toxic pesticide, ignored the storm warnings and left the safety of Manila Bay on June 21, 2008 on what was to have been a routine 22-hour trip south to Cebu City on Cebu Island. The ferry was about half-way into its journey when Typhoon Fengshen, packing winds gusting up to 121 miles per hour, slammed the island archipelago. The winds and torrential rains ravaged the mainland, ripping roofs from buildings, causing flash flooding and mudslides. At least 155 people were killed and thousands were left homeless by the storm. At sea the storm quickly overpowered the Princess of the Sea. Survivors told how the ferry began rolling heavily in the morning. As the storm intensified, Captain Marimon began radio calls for help. Some reports said the ship’s engines had failed and the ferry was caught in the trough of the massive waves just off the island of Romblom. Efforts by the local Coast Guard to send vessels to reach the stricken ferry failed because of the fury of the storm. All contact with the ferry was lost at about 12:30 p.m. That was when the ship capsized, first on its side, then turned upside down, with most of the passengers trapped inside. Anyone that remembers the film The Poseidon Adventure might have some idea what being inside a ship that turns upside down at sea might be like. Most of the 800 souls that died were trapped below deck. The captain had issued the order to abandon ship about a half hour before the vessel capsized, and a number of passengers were on deck, probably clinging to anything they could hang onto as they were battered by the storm. The crew members were so busy trying to save themselves that passengers were given little assistance in finding life belts or launching life boats. That was the conclusion of the local Coast Guard and naval rescue units that finally reached the hull of the still floating but overturned ferry. About 115 bodies were recovered in the water and the others were believed still trapped inside the ship. One report said that when the ferry sent a distress signal, officials at nearby Sibuyan Island sent a boat to investigate. It got close enough to report that the ferry was partly submerged and a hole was observed in the hull. Later it was determined that what they saw was the ship’s bow thruster. They were looking at the bottom of an overturned ship still afloat in the storm. Knowing that there was enough air trapped inside the hull to keep the wreck afloat, there was hope that some people may have still been alive but caught in the air bubble. They tapped on the hull in an effort to get some kind of return signal, but no noises were heard. And when divers were sent inside all they found were bodies. The work of recovering the bodies was hampered after it was discovered the ship was carrying ten tons of the toxic pesticide endosulfan in its cargo. The pesticide was destined for a Del Monte pineapple plantation. Under Philippine law was illegal for passenger ships to also carry toxic chemicals in their cargo. It was feared that the divers that had been working to remove the remains of the dead may have been exposed to the pesticide. The chemical can cause mental and genetic disorders, skin reactions, affect the nervous system and even death. The ship’s owners stated during hearings that the endosulfan cargo had been accidentally loaded by dock workers onto the wrong vessel. A fishing ban was imposed in the waters around the wreck and divers had to wear special chemical-resistant diving suits, shipped from Singapore, to remove the chemical cargo as well as the rest of the bodies. The wreck also had about 100,000 liters of diesel fuel in its tanks. 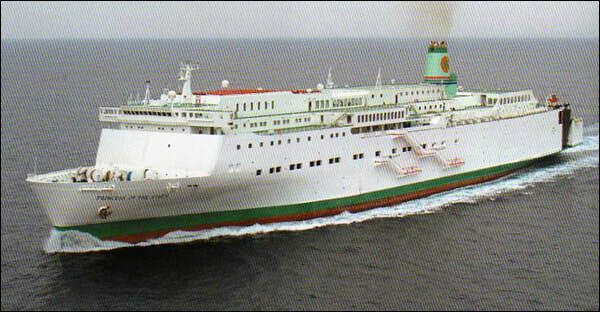 The vessel was launched as the MV Ferry Lilac in Japan in 1984. It had the capacity of carrying as many as 1,992 passengers.